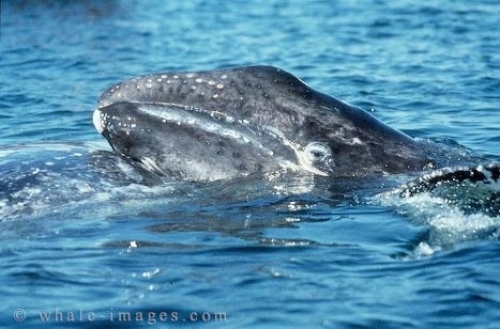 Gray Whale Photo - Gray Whales - Eschrichtius Robustus, Baja California - Mexico. I captured this gray whale photo just as a young calf surfaced and rested his chin on the back of, presumably, his mother. He was checking me out from a safe distance and with the security of having mom right there before slipping back into the water. I spent quite some time with these friendly whales and it was a special experience and opportunity for getting a gray whale photo.